This session's discussion centered on two readings: Richard E. Wagner, "Austrian Cycle Theory: Saving the Wheat while Discarding the Chaff" The Review of Austrian Economics, 12(1), 65-80, 1999; and Walter Block, "Yes, We Have No Chaff: A Reply to Wagner's 'Austrian Cycle Theory: Saving the Wheat While Discarding the Chaff'" The Quarterly Journal of Austrian Economics, 4(1), 63-73, 2001. I was rather disappointed by both of these articles. The first thing that caught my attention was the very condescending tone of the Wagner article. He refers several times to the "canonical" version of the Austrian Business Cycle Theory (ABCT). It is as if he thinks that there is no independent thought among Austrians, that there is no debate, and that if one doesn't hold to the "cannon" then they are out of the Austrian club. How ridiculous! It's insulting and demeaning. There are two major criticisms that Wagner puts forward in opposition to the ABCT. They have both been argued and reargued for decades. Wagner is apparently unaware of these debates or he simply has chosen to ignore them. The first criticism can actually be traced to Gottfried Haberler. Haberler wrote a summary of the different theories of the business cycle for the League of Nations. This work was then converted into the book Prosperity and Depression (1937). Joe Salerno presented a paper at the 2011 Austrian Scholars Conference on Haberler's portrayal of the ABCT. Salerno makes the point that Haberler mistakes the malinvestment theory for one of an inefficient use of resources. Here is Haberler's story. The Central Bank expands credit and pushes down interest rates. As a result, entrepreneurs are misled into investing in the earlier stages of production. So far the story is right, but it is missing an important element. Haberler's story is that we start with the Structure of Production at point A. When the new, (lower) interest rates emerge, we slide out to point B. 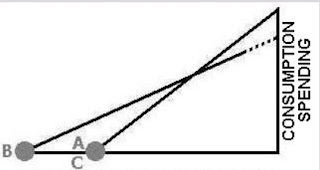 When the market recognizes the mistake, we slide to back to point A. Thus Haberler and those who have followed his characterization of the ABCT have dismissed the ABCT as an inadequate theory. If this were all that the ABCT was, then I would also dismiss it as a simple theory of a misallocation of resources and the resetting of them. Here we see what John Cochran calls "The Dueling Structure of Pro- duction." (See QJAE 4(3), p. 19, 2001.) When the interest rate falls it sends a signal not only to investors and entrepreneurs to invest more. It also tells consumers that the return on savings has fallen. As a result, income saved falls and income consumed rises. Thus, the structure of production is split and torn apart in two directions. For the mainstream macroeconomist, he sees C (consumption) and I (investment) increasing together, which is solid GDP growth. Unfortunately, this information is misleading. The modern macroeconomist is misled due to the overaggregation of his statistics. The invested capital also has various degrees of specificity and substitutability. As a result, the conversion of the malinvestment into sustainable capital structures can be long and difficult. It is that conversion process that is the recession. The second objection that Wanger raises against the ABCT centers on expectations. There is an old objection to the ABCT that says, "if people knew the ABCT, then when they look at the actions of the Central Bank, they could adjust and avoid the Boom and the Bust." This logic is built upon Haberler's mischaracterization of the ABCT. The ABCT is not about sectoral shifts in resources. It is about soldifying liquid capital into specific production methods and then breaking them up as the malinvestments are revealed. Furthermore, the Austrians model money as being non-neutral and so even if an entrepreneur had the knowledge of what has happening, the Cantillon effects are unavoidable. Block centers his criticism of the Wagner article on this particular point. The best argument he makes is that, "those who shift resources from the lower to the higher orders of production [will do so] in response to a lowering of the loan rate of interest, even if they know this emanates from Fed machinations, not a change in time preference, and thus [it] can only be temporary." While the argument is correct, Block does not hammer the point. 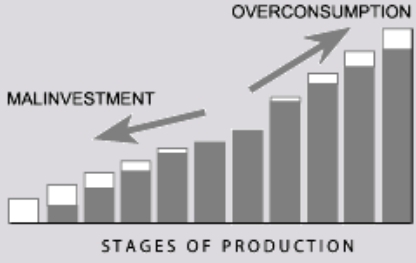 In my opinion the best explanation on why entrepreneurs must expand with lower credit, even if they know that it will lead to a boom / bust cycle, is found in Carrilli and Dempster, "Expectations in Austrian Business Cycle Theory: An Application of the Prisoner's Dilemma," The Review of Austrian Economics, 14(4), 2001. They set the problem up as a prisoner's dilemma in which the global solution may look like no one should borrow the new credit and invest, but the local solution is that they must. With money being injected sequentially into the economy and injected at specific points, the non-neutral Cantillon effects show that those who get (and use) the new money first are the big winners. Those who get the money last (or choose not to use it) lose. Great article! I have question about "I" and it's relationship to savings. I understand what savings is and how it fits into the Austrian capital structure. But my confusion comes from the equation that I see at times of "Savings = Investment." Is this truly an identity? I understand that savings is needed for investment, but does Savings = Investment? That is a good question, "When does savings equate with investment?" The quick answer is that they are the same in equilibrium. The breakdown of this relationship occurs during the course of the Central Bank's artificial lowering of the interest rates. When this happens, there is a separation between savings (S) and investment (I). It is this separation that allows the artificial boom to take off. Thanks for the response. Yes it helps, but let me make sure I completely understand. Without a Central Bank, savings would get turned into investment via the financial system (Savings = Investment). When a Central Bank lowers the interest rate we get Savings < Investment. Is it possible to have Savings > Investment? Could this happen when people increase their cash balances? Is there a detrimental effect when this occurs? It is possible to have savings exceed investment. Think of interest rates as a price that is created by the interaction of supply and demand. In the earlier case, when the price is pushed below equilibrium by the central bank, the quantity demanded (investments) exceeds the quantity supplied (savings). We can think of it as a price ceiling below the equilibrium rate. To get savings to exceed investment we need a price floor set above the equilibrium rate. Then we will see a surplus of loanable funds. What could happen to those funds? Typically we see them leave the country in the form of foreign investment. So if there are no good business opportunities in one's own country (e.g., the government is misbehaving) and there are few consumer goods, then net savings will flow out of the country. The other option is that, as you point out, people hold on to higher cash balances. Whether any of these are detrimental all depends on your point of view.